Welcome to May! It's time for the first Nintendo Download of the month and this time we are getting FUNKY! 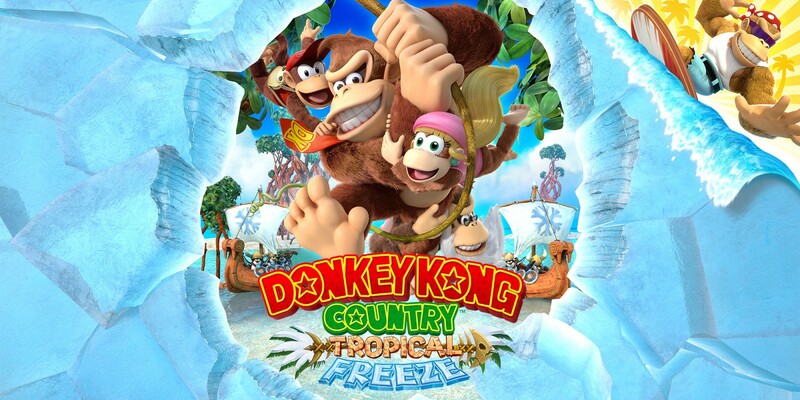 Donkey Kong Country: Tropical Freeze headlines our new releases this week. What else is out there for us to enjoy? Donkey Kong Country: Tropical Freeze – Barrel blast into a critically acclaimed Donkey Kong adventure as this beloved franchise makes its Nintendo Switch debut with a (banana) bunch of new features. Traverse islands packed with platforming perfection and nonstop action as the classic Kongs in the original game, or mix things up by playing the story as Funky Kong in new Funky Mode for a more approachable experience for players of all ages and skill levels. The Donkey Kong Country: Tropical Freeze game will be available on May 4. Nihilumbra – Discover the beautiful world of Nihilumbra and join Born on his adventure to find himself whilst trying to escape from his inevitable curse. Born was created from absolute nothingness: The Void. But somehow, he separates himself from the black emptiness and appears in the world. This begins his long odyssey, during which he will learn how to use the colors around him to gain powerful abilities and transform the world. Shantae: Half-Genie Hero Ultimate Edition – Save the day as belly dancing half-genie Shantae, conquer Sequin Land as the evil Risky Boots in “Pirate Queen’s Quest” and swap between Sky, Bolo and Rottytops in “Friends to the End!” Use multiple abilities while in different forms: wall jump as Ninja Shantae, soak up sun as Beach Shantae and serve justice as Officer Shantae. The Shantae: Half-Genie Hero Ultimate Edition game will be available on May 8. Too Cool for Hyrule: May My Nintendo Rewards – May is a special month for The Legend of Zelda fans! The Hyrule Warriors: Definitive Edition game for the Nintendo Switch system launches on May 18. To celebrate the game’s launch, My Nintendo is offering the Legend of Zelda: Majora’s Mask: Dire Moon Nintendo 3DS HOME Menu theme. You can redeem your My Nintendo points up to five times to receive up to five codes for the theme. Don’t forget to redeem your points for a wallpaper and a May calendar featuring the Hyrule Warriors: Definitive Edition game. Enjoy the month of May with great discounts on select games in the Legend of Zeldaseries. For more info, visit https://my.nintendo.com/news/e5335141c5d8c4dd. I will be playing DKC:TF. I definitely didn't give it the time it deserved on the Wii U. Playing on the Switch will totally change that.